When Julie Lisnet, one of the founding members of Ten Bucks Theatre Co., was a college student working at the Porteous department store in the Bangor Mall in the early 1980s, the idea of there being a theater company in the mall — let alone anything other than retail stores and a food court — was a pretty ridiculous notion. Nearly 40 years later, the Bangor Mall — struggling to retain tenants and its value, and recently put up for auction starting at $6.5 million — is a drastically different place, and a theater in a mall isn’t such a wild idea. When Ten Bucks Theatre unveils its new Bangor Mall performance space this weekend with the grand opening production of the comedy “The Complete Works of William Shakespeare (Abridged),” it’ll join a church and a fitness studio as one of the more unorthodox tenants in the 40-year-old shopping center. Located on the side of the mall that formerly housed Sears, and across from U.S. Cellular and The Shoe Dept., the new theater space has been occupied by Ten Bucks since October 2018, but has been in the works in one way or another since the summer of 2017. Jennifer Snow, board president, said the hunt for a new space for the company had been on for well over a year before leasing a storefront in the mall became a possibility. For all of its 19-year existence, Ten Bucks has been fairly nomadic, performing at the Brewer Middle School, at the Next Generation Theatre in Brewer, at outdoor venues around eastern Maine for its annual summertime Shakespeare Under the Stars production, and, for the past 10 years, at Comins Hall in Eddington, about 20 minutes outside of Bangor. The Ten Bucks board poked around commercial real estate listings in Bangor and Brewer for a long while, and had even considered a space in the mall initially — but all the spaces available at the mall back in 2017 were either far too big, or way too small. When they checked back in this past summer, however, the right place had become available: former clothing retailer PacSun, which closed in January 2018. All that storage space meant that Ten Bucks could move its entire costume and scene shop, held in rented storage spaces for years, to its new location. It also meant that members of the company have put in a lot of volunteer time over the past three months, tearing down old fixtures, building a stage, and organizing racks and racks of costumes. The new space can seat up to 100 people, and has a lot of versatility in terms of seating and stage arrangements. 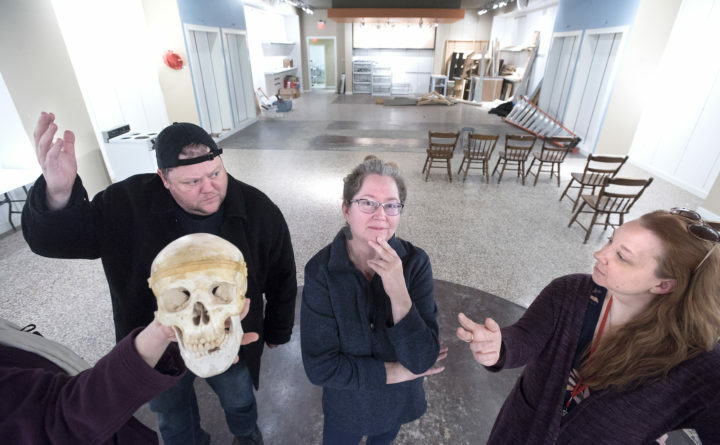 The public will get its first chance to see the new space on Friday, for a one-weekend, three-show run of “The Complete Works of William Shakespeare (Abridged),” a comedic parody in which three actors perform extremely abridged versions of all of Shakespeare’s plays in under two hours. Directed by Ben Layman, the show is a quick, enjoyable romp with which to kick off a new chapter for Ten Bucks — and for the Bangor Mall. Layman, who has directed and performed in the Bangor area for more than a decade, said he believes that opening an artistic space in the mall is an important step forward for the area’s arts community. “The Complete Works of Williams Shakespeare (Abridged)” will be performed at 7 p.m. Friday, 8 p.m. Saturday and 2 p.m. Sunday. Tickets for Friday and Sunday are $10 at the door; tickets for Saturday’s performance are $20, and include a gala opening night party at 6 p.m. prior to the performance. For more information, visit tenbuckstheatre.org.